by Jerald Simon on October 31, 2017 in Blog, Motivation in a Minute! Everyone is on their own journey in life. Some of us may be headed in the same direction and walking side by side one another on our own paths. Most of us are heading toward what we hope we will one day obtain, learn, know, do, or be, and all are experiencing the good and bad times that accompany the journey. When the road on which you are journeying becomes difficult or unsettling, what do you do? Do you keep going? Turn around? Stop? Ask for directions? What do you do when a pothole or two pops up in front of you unexpectedly? The answers will be as different and as difficult to answer as the many unique personalities that exist on this earth. What works for one will not work for another. It cannot because each person must learn and do what works best for them individually. We each must find our own path, and we can and will receive help from those who have come before us and those who are currently experiencing their own unique journey beside us. The key is to enjoy every new twist and turn along the way. We may not enjoy every step, especially the difficult ones, but we can find the good even when surrounded by the bad. We can see the light even when the darkness creeps in around us. We can hear the beautiful melodies of life even when the trying times bring discord and harsh harmonies that muffle the beautiful melody we long to hear. Take the good with the bad. Enjoy the light even when the darkness tries to dispel the rays of hope and securities of sunshine. Discover how beautiful those harmonious accents of discord can become when precisely placed between a melodic line we know and love. 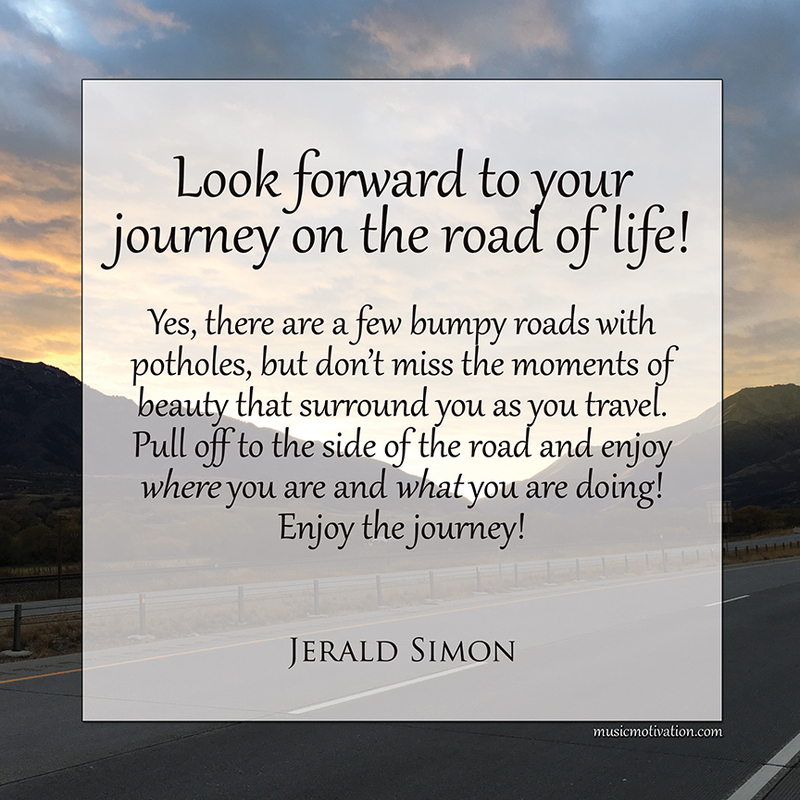 Look forward to your journey on the road of life. Pull off to the side of the road and take a picture or two. It’s okay to stop moving forward and just be present in the moment of experiences that surround you. That is okay and even necessary.